If there was ever any doubt The Hobbit movies fell into the category of children’s fantasy (as opposed to adult fantasy), The Battle of the Five Armies makes this label official. It’s just as well, since J.R.R. Tolkien’s source novel is also technically children’s fantasy. But the movies, I feel, were something the filmmakers wanted audiences, including adults, to take seriously, or as seriously as fantasy can be taken. Children’s fantasy, though, almost seems inextricably linked to (and pre-defined by) a lack of seriousness. That’s not to say children’s fantasy is an unworthy genre or that kids and teenagers won’t find The Hobbit series thrilling and involving, which is good for them, but the discrepancy between what the filmmakers aimed to do and what they actually accomplish, as far as substance is concerned, will cause most grown-ups to register it as trifling and frivolous. At this point in the saga, I was even inclined to laugh at “Battle” for being so silly, with its superficial dialogue and predictable outcome. And yet, at the same time, I also found it fun and exciting, especially when I let my guard down and accepted it as nothing more than light, inconsequential entertainment. In this regard, it works, and nicely, though not superbly, caps the story off. As the title suggests, Peter Jackson’s unnecessarily drawn-out adaptation of Tolkien’s classic boils down to a magnificent battle, and just like the first two movies, it goes on for too long. Still, Jackson and his team lend it a consistent energy, with the action and stunts doing most of the heavy lifting to keep our engagement afloat. As far as the drama, though, it’s best described as merely serviceable. 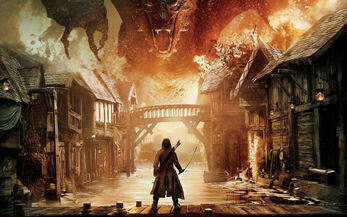 The Desolation of Smaug had spread our emotional investment in the characters and their plight too thin and unfortunately “Battle” never fully makes up for it, although it does rebound our interest, which is crucial.